As botas são outra coisa que me ajudou e, muito! As de cano alto voltaram a conquistar-me pelo facto de serem extremamente confortaveis (apesar de pertencerem à minha irmã e serem em tamanho 35, sim.. não sei, mas o meu pé lá obedeceu!) e parece que os meus tempos de escolinha com botinhas até cá acima voltaram, algo que já não usava há uns anitos. The boots are another thing that helped me, and a lot I must say! The high barreled boots have conquered me once again, they’re are extremely comfortable (although they belong to my sister and in size 35, Yes … I don’t know how, but my foot obeyed!) 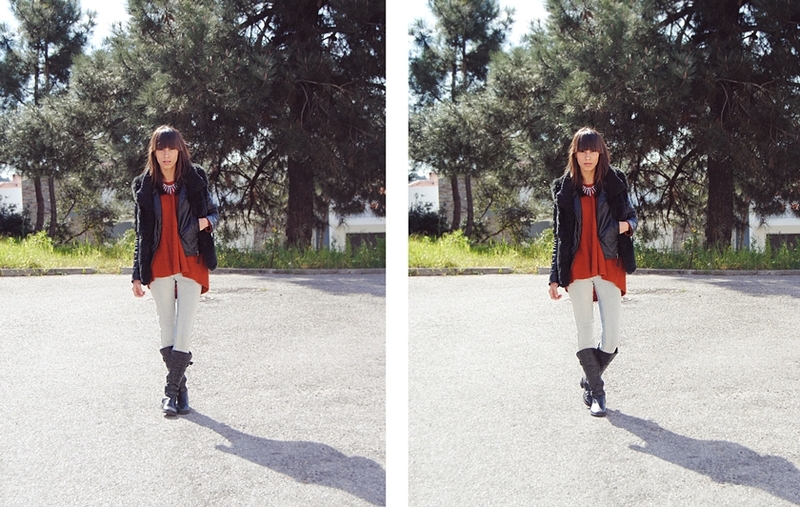 and it seems that my school times with knee-lenght boots returned! Estavas tão gira! Adoro a conjugação do casaco com o colete. Beijinho minha querida. Nice 🙂 Gostei, sim sra! The shirt is amazing ! oh wow, you have an amazing style babe! adoro o teu corte de cabelo, fica-te mesmo bem ! Gostei bastante, eu tambem gosto muito de camadas. Acho que da um toque muito bom, e esse colete obviamente se nao tivesse ai, ja nao era a mesma coisa. you're beautiful and your blog is awesome! Wauw love your outfit! Nice blog! Love that knit, the color it's just perfect!!! You look great, love the colour of that jumper on you! I've always been keen on layers. You rock them! Cold make us combine pieces that we didn't imagine they look beautiful together. you look so beautiful! Isso é mesmo uma verdade *-* a sério e normalmente quando menos esperamos! Really like your blog. Nice outfit! I'll be following you. You want to follow me back? eu adorei, estás super linda! Love the layered pieciness of the outfit and the red just pops!! check out mine and follow back? love!! I love the laidback rocker feel to this look. És linda, esse corte de cabelo fica-te mesmo bem!